Those who study the art of precision shooting know that today a good marksman will easily spend 5 figures on equipment, thousands of hours of practice and development, and at least a dollar per shot. All this with the singular objective of being able to project a few kilojoules of energy up to a mile or so away as quickly and accurately as possible. Today the tool of the trade is the rifle: essentially a tube that converts chemical energy from a gunpowder-fueled cartridge into the kinetic energy of a spin-stabilized bullet. Riflemen go to great lengths to maximize how precisely they can get this machine to project a bullet into the atmosphere. But under field conditions accuracy is limited to about half a minute of arc (i.e., half an inch of error per 100 yards distance from a target). The physics of atmospheric ballistics require heavier equipment to reach further distances, and put the outer limit of a man-portable rifle’s range at about 1.5 miles. Thanks to evolutionary advances in optics, ballistics, firearms, and cartridges, the capabilities of riflemen have never been greater. But the whole art seems somewhat archaic. In time precision rifles will go the way of blackpowder muskets, replaced, I suspect, by optical firearms. This may at first sound like trite science fiction — am I seriously writing about the advent of rayguns? Well yes, but consider how and why this wouldn’t be as revolutionary as it sounds: The first optical firearms will probably fire chemical lasers. Current single-shot chemical lasers are roughly 30% efficient at converting chemical energy into optical energy. They require supersonic mixing of reagents and generate a lot of heat. Current rifles are also about 30% efficient at converting the chemical energy of smokeless powder into supersonic kinetic energy, and also generate a lot of heat. From this point on optical firearms take the lead: A ballistic projectile begins to lose energy and accuracy due to atmospheric interactions from the moment it leaves the barrel. Optical energy follows a line of sight at the speed of light and loses energy only to the degree that its wavelength is dispersed by the atmosphere through which it travels. 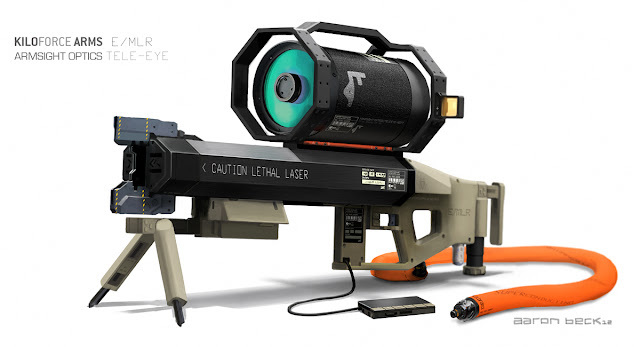 Chemical laser firearms could be similar to current rifles in many ways. They will probably employ a single cartridge per shot containing not only the chemical reagents but also an explosive “primer” to mix them when fired. Instead of projecting a bullet into a rifled barrel for acceleration, the cartridge will project the mixture into an optical cavity where mirrors and lenses will focus the flash of high-powered light out the muzzle. Depending on the particular technology the reagents may leave the gun like a muzzle blast, or stay in the cartridge for ejection. Optical cartridges could be reloadable by shooters, just like ballistic cartridges. So where’s the sport in that? If you can see it you can put a hole in it? As now, a lot of the critical cartridge development will be done by professional chemists at propellant manufacturers. Gun makers will be mostly replaced with the manufacturers who are already making the rugged, precision glass for 4-figure riflescopes. Perhaps marksmen will switch their focus to tricks for pushing the diffraction limit with man-portable optics to further range and accuracy? This entry was posted in Arms on November 15, 2012 by federalist. Two interesting points: First, if the laser is infrared, then the target literally won’t see it coming (nor will those around him). Second, there will be a new concept of ricochet — if anything at the target is reflective, some of the energy will bounce off to hit elsewhere. Note that chemical lasers scale down far more easily in principle than do solid-state lasers. The latter have to be electrically pumped, and electric power density is a major problem of interest to everyone who uses battery-powered devices (from cell-phones to electric cars). Apparently the state-of-the-art in solid-state “man-portable” laser weapons is Boeing’s Compact Laser Weapon System (LWS). Total system weight is 650 pounds to run a 10kW laser (but not including any power source to recharge its battery).